This is an all-too-common scenario for children at this age and stage of their young lives. The class, lesson or sport sounds ideal (to you, the parents, at least), and yet your child is not willing to participate, would rather observe, or refuses to get in the pool or go out on the field altogether. I understand why this is confusing, especially when you’ve observed that your child loves playing with other children, kicking or throwing a ball, being outside (or all three!) but as soon as you enroll her in a group activity, she shuts down. When my first child was a young toddler, I enrolled him in a music class with me. He loved listening to and creating music on his own at home, so I figured the class would be a great fit. Instead, he spent the hour of class shying quietly away from the group and never participating. The music instructor was not so kind. When the session was over, she suggested that I skip enrolling him for the next term. I was embarrassed and wished that my son had better taken to the class (and that I hadn’t wasted a bunch of money learning the hard way that just because he liked music didn’t mean he’d like music class). For several years, my son refused to be part of group activities and I struggled between letting him just be and worrying if his reaction was “normal.” Then, at age eight he begged us to play Little League baseball. Ten years later, at eighteen, he is playing his final season. What’s the lesson? Don’t push it. This lesson is backed by developmental research. Children who are put into activities too young are likely to feel frustration and refuse to participate or drop out. The experience may even turn your child off to the activity for the long term. Wait until your child is older and more ready, which varies greatly from child to child. As a basic guideline, the American Academy of Pediatrics warns that group sports activities are not appropriate before age 6. 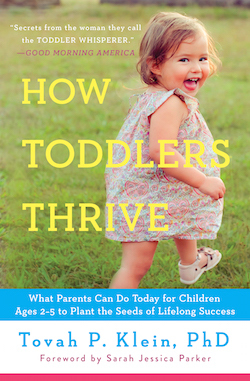 I encourage you to think similarly about other adult-led group classes for toddlers. I understand the urge of parents to sign their kids up for all kinds of activities. In the last several years, organized classes and events for young ones have proliferated at an exponential rate. It’s become like a rite of childhood passage, and it may seem like the earlier you start your child on skill building, the better. But in fact, the opposite holds true. Why? Group activities require children to pay attention, listen and follow instructions to do the activity or sport a certain way. These are all good skills for your child to learn and master, except that young children, and toddlers in particular, learn differently. At this young age they learn best by hands-on doing, making up their own rules, experimenting, making mistakes and coming up with various ways to meet their goal. Group sports, lessons and other activities circumvent this process because the child is not self directed but led by an adult. While many of these group activities appear to be fun for your child, there can be negative, longer-term costs. These activities can actually work against your child’s development as they take away from free play and figuring things out on their own (with adult support when needed) that is central to this stage of learning. Before age six, hands off works better than hands on. Learning actions through play, at your child’s pace, is what will help your little one master physical, social, emotional and cognitive skills. Learning teamwork, safety rules, and goals of organized activities comes later. What I see over and over again (and scientific studies confirm) is that the base skills children are developing during these early years is built best through play, indoors and out, with friends and on their own. During free play, children have the space and freedom to think their own ideas without the limits of imposed rules. They imagine, make choices and decisions for themselves. The inherent pleasure in playing drives them to keep playing, which is key, as it builds confidence in the young child, “I have ideas, I can try them out, I can try again.” This naturally derived, pleasure-driven motivation turns into initiative and persistence over time. In fact, these are the necessary skills they will take into organized activities and sports as they grow up. This is equally true during physical play when children move their bodies in different ways, including taking new risks and challenges that test their limits and power (‘Can I jump from that step or climb that high?’). Your child makes decisions about what she wants to do and how she will do it. Through physical play your child connects to his growing body while learning to balance, jump, kick, run and determine the boundaries of his personal space. I recall my son at age five mastering pumping on the swing and going so high I feared he’d fly off. I could barely watch. His reaction was not fear, but glee! The confidence sparked from that vigorous physical activity transferred into our house when he approached new tasks like learning to tie his shoes without apprehension but with excitement. WHAT YOU CAN DO TODAY: Support your child’s free play and engage their curiosity and inquisitiveness. Provide ample opportunities for your child to play freely outdoors. Be outside as much as you can—the backyard, garden, a park or playground, walking on a trail or collecting sticks and rocks in the woods—where they can get to know the natural environment and its elements. For example, if it is raining, they can explore the world with rain boots in puddles. Consider also child friendly local adventures in your area such as the nature center, zoo or children’s museums. When your children climb structures or trees, hang from the monkey bars, swing, slide, jump and run they are moving their bodies in ways that help them discover their physical capabilities, build confidence and resilience. Research also shows that children who have more outside physical play can focus better in school. Indoors, provide materials and plenty of time for open-ended play without adult direction or set goals. In other words, let your child decide what to do for play by providing materials and letting him choose. Here are a few examples of what your child takes from open-ended play. Blocks, Lego, Magna tiles and other building items give her opportunities to build, create, implement ideas and decide how to try again when the big towers fall down (problem solving)! Math and spatial skills are learned through building. Art projects and play dough/clay/painting support thinking, creativity and imagination. Pretend play provides a world of learning unto itself (stay tuned for more on this in a future newsletter). When they are playing with other kids, they also learn negotiation, compromise, empathy and how to handle conflict and how to get along. Play is first and foremost fun, freeing and without right or wrong answers. Through this, your child builds the foundation to take part in adult instructed activities at the age appropriate time. My take-home advice is to help your young child build that foundation through play now so they can thrive in group activities later. What are your experiences with lessons, organized sports and activities for your young ones? Connect and share them with the toddler community on Facebook or Twitter. Lastly, when your toddler tantrums a lot, I interpret this as their way of saying they need more time to be outside and move their bodies! For how to handle the toddler meltdown, read this piece on ways to keep your cool during a tantrum from Motherly.